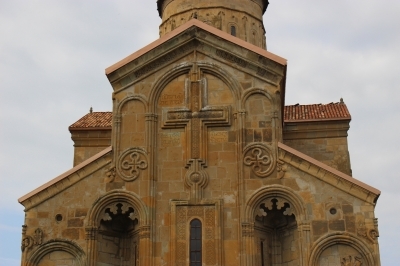 Samtavisi Cathedral is part of the Tentative list of Georgia in order to qualify for inclusion in the World Heritage List. Samtavisi Cathedral is located about an hour drive from Tbilissi, close to the Gori highway. It can been seen from the highway bridge crossing the Lekhura river. To get there, use Kaspi exit and get to the small village (Igoeti on google map) immediatly south of the highway. Most marshrutka (collective taxi) do stop in Igoeti on demand. A small tunnel passes under the highway. The road passes a police station, and goes north for about 1 km north. This almost square cathedral, was built in 1030, and was partially reconstructed in the 15th and 19th centuries, after earthquake destructions. The eastern façade is original (on the picture). It was built on the site of an earlier monastery built in 472. The brief description on the unesco site does not clearly specify its OUV. It seems to be a first example of a new design of religious building, with a shortend longitudinal axis and a more compact an intimate interal space. This quare-shaped design remains enchanged in the following centuries. Entrance is free, through a nice 17th century gate belfry. In the courtyard are the remains of the bishop’s residence, of another church and of several tombs. Feel free to push the small door on the north side of the cathedral to get a glimpse of the interior. I really enjoyed visiting this small cathedral, probably because it was the first monument I visited after my arrival in Georgia, and the first Orthodox church. I had the site for myself and it felt very atmospheric.